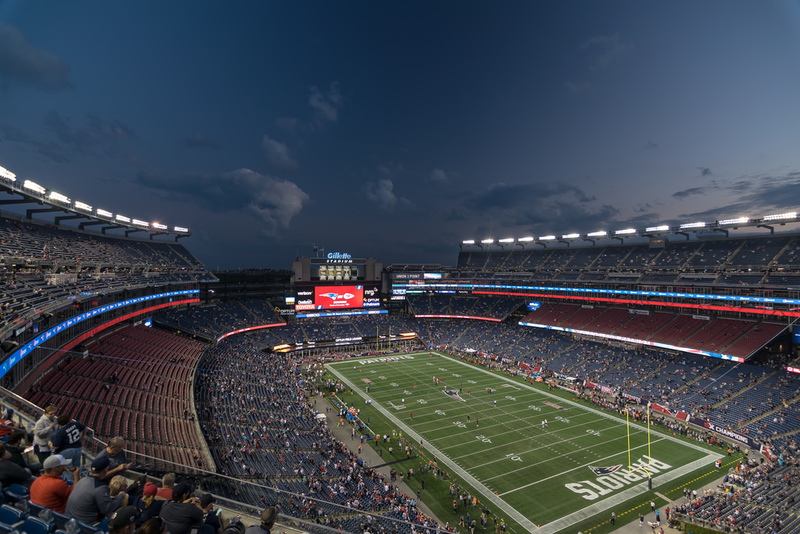 With superstars such as quarterback Tom Brady and a winning percentage of .830, Gillette Stadium has been the home to one of the best teams in the NFL since its opening in 2002. The Patriots have been a part of the New England football landscape since 1960 when they played at Nickerson Field. They played at Fenway Park, Alumni Stadium and Harvard Stadium before moving into Foxboro Stadium in 1971. Foxboro Stadium could easily be mistaken for a college football stadium instead of a NFL stadium. Even though it seated over 60,000 fans, by the 1990s it lacked many amenities that newer stadiums possessed. The Patriots nearly left Foxboro for St. Louis after James Orthweinin bought the club in 1992. However, Robert Kraft, who owned Foxboro Stadium purchased the Patriots in 1994, keeping them in New England. By the mid 1990s, the building boom of new stadiums was in full swing and the Patriots began lobbying for a new stadium. Sites in South Boston, 22 miles from Foxboro, and in Providence, RI, were proposed but never materialized. In 1998, the Patriots and the State of Connecticut reached an agreement to build a stadium in Hartford, CT, but failed because of site issues and pressure from the NFL. After several referendums failed to pass, Kraft decided to use his own money to construct the Patriots a new stadium. Construction on the Patriots new stadium began on March 24, 2000. 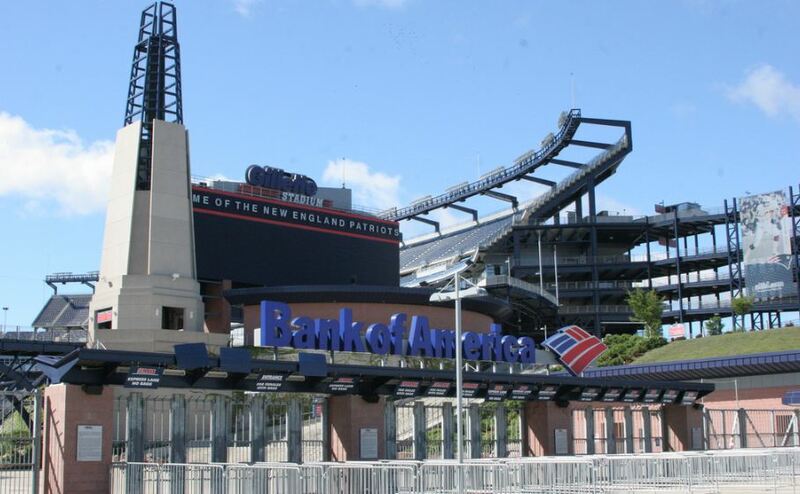 Like many other NFL teams, the Patriots sold the naming rights to the stadium. Originally, CMGI Investments purchased the naming rights. However, in August 2002, the Gillette Company bought the naming rights to the stadium after CMGI Investments faced financial failures. QB Tom Brady receives NFL MVP and Offensive Player of the Year in 2007 and 2010. Bill Belichick is awarded Coach of the Year in 2003, ’07 and ’10. The New England Patriots played their first game at Gillette Stadium on September 9, 2002. Gillette Stadium is a vast improvement over Foxboro Stadium. The stadium has 68,000 seats, the majority on both sidelines consisting of three seating decks. The lower section of seats nearly enclose the field, while the club and upper levels of seating are on both sides of the gridiron. All of the seats are angled toward the 50 yard line giving fans an excellent view of the action on the field. Gillette Stadium has 89 luxury suites and over 6,000 club seats. Two massive video/scoreboards are located beyond both endzones. Gillette Stadium also has a 120,000 square foot Patriots Club lounge that is used year-around. A lighthouse motif and a bridge bring a New England feel to the stadium in the Patriot Place Plaza. These are located at the North Portal Plaza, where many fans enter the stadium. Adjacent to the stadium is The Hall at Patriot Place, an interactive 30,000 square feet New England Patriots Hall of Fame. There have been few changes at the stadium since its opening. The grass playing field was the most problematic issue, but it was replaced with Fieldturf during the 2006 season. Prior to the start of the 2015 season, the Patriots added the Optum Field Lounge in the south endzone. This upscale bar and lounge is directly on the field level giving fans an up-close perspective to the action on the field. Approximately 2,000 seats were removed from the stadium in order to construction this area, decreasing the seating capacity to 66,000. 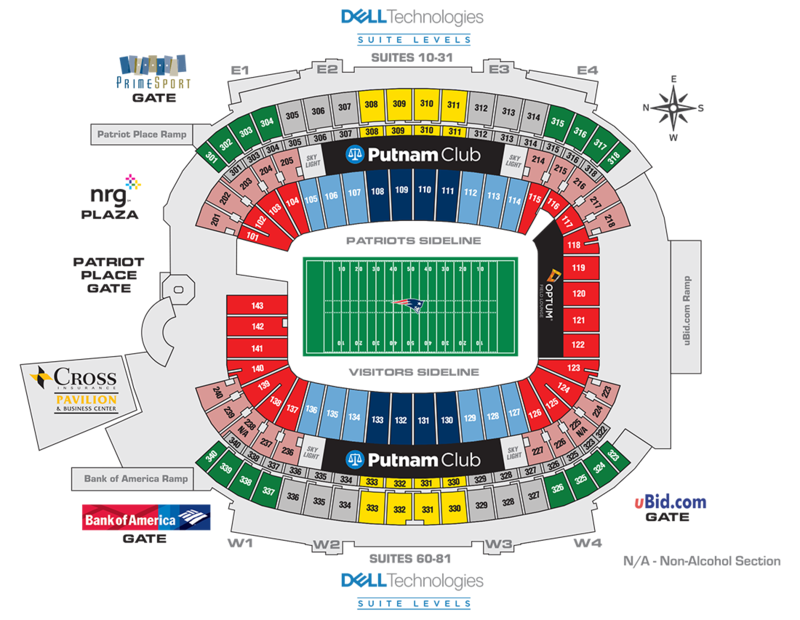 Gillette Stadium is also the home of the New England Revolution (MLS), the UMass Minutemen (NCAA) and numerous other sporting events, including the 2016 NHL Winter Classic between the Boston Bruins and Montreal Canadians. The Patriots have been dominate since the opening of Gillette Stadium in 2002 as they have made the playoffs 16 times and won six Super Bowl Championships under coach Bill Belichick.